Tears in the Fence magazine held a very enjoyable mini-festival in the lovely new village hall in Stourpaine last weekend. 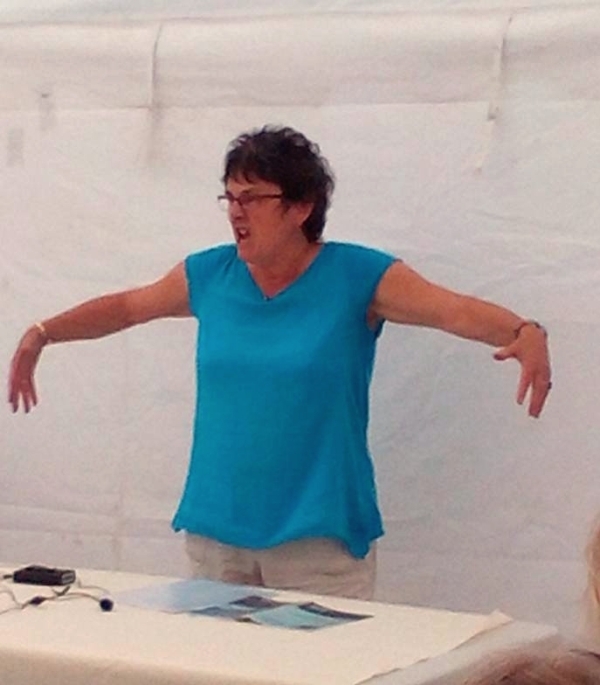 Saturday’s events started with a rather challenging workshop on hybrid forms of poetry, facilitated by David Caddy. Some remarkable pieces of work emerged during the short time available. I’d be surprised if we don’t see some of them in print. 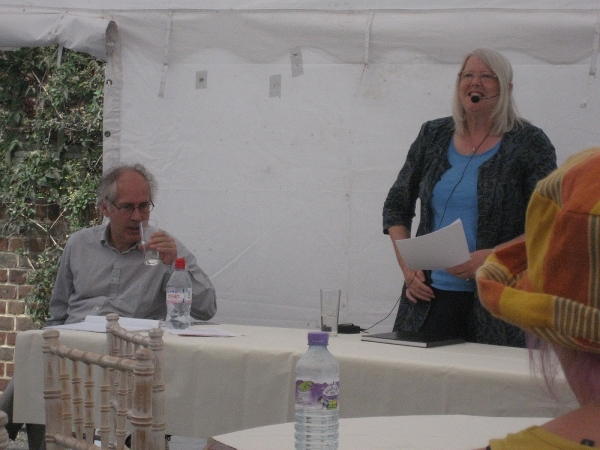 Poets reading in the afternoon included seven from the Fountain group. The event was a fund-raiser for next year’s full-scale festival. Here some of the Fountain poets perform their collaboration “Second Skin”. From the left, they are Morag Kiziewicz, Sara Butler, Ama Bolton, Rachael Clyne, Jinny Fisher and Jo Waterworth. Photo courtesy of Andrew Henon, who skillfully combined filming the event with reading his own work. See also Mo’s report here. This entry was posted in poetry, writing workshops and tagged Ama Bolton, Andrew Henon, David Caddy, Jinny Fisher, Jo Waterworth, Morag Kiziewicz, Rachael Clyne, Sara Butler, Tears in the Fence on September 20, 2016 by barleybooks. After a summer break we met again on 5 September at the Sherston Inn. 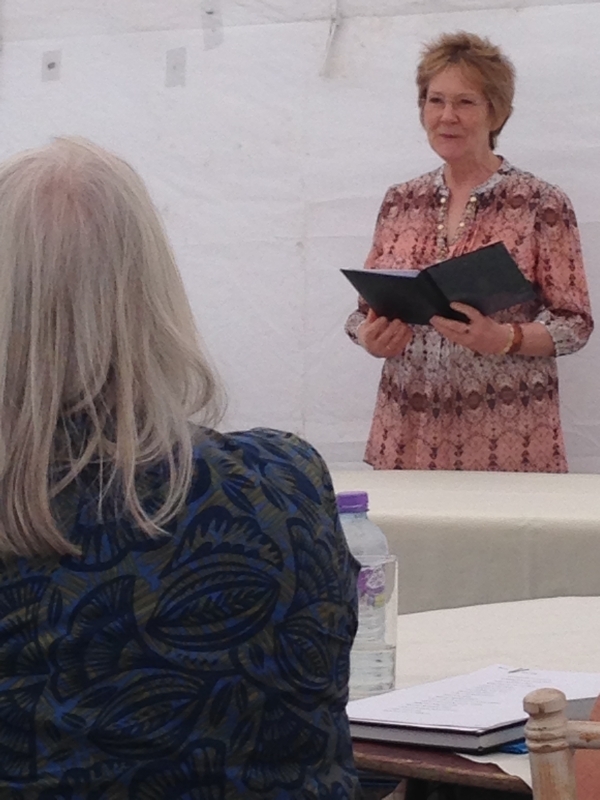 We began with a reading by Clare Diprose from her pamphlet “Thinking of You”. It was lovely to hear the poems together and to get a sense of this Bridport Prize runner-up’s style – assured, economical, observant, with an instinct for the right word and a way of catching you off-guard with a haunting phrase. We heard poems from Ewa, Ewan, Wendy, Jo, Caroline, Morag, Rachael, Jinny, David and Ama. Paul sent in a poem which was read by Ama. This post’s title is taken from Ewa’s poem about a visit to Burnham-on-Sea. Rachael’s “Tradition” has been published in the latest issue of The Rialto, and she has been short-listed in this year’s Poetry Space competition. Ama has a poem “Hartlake” in the new issue of Obsessed with Pipework. Morag has a poem forthcoming in Tears in the Fence. 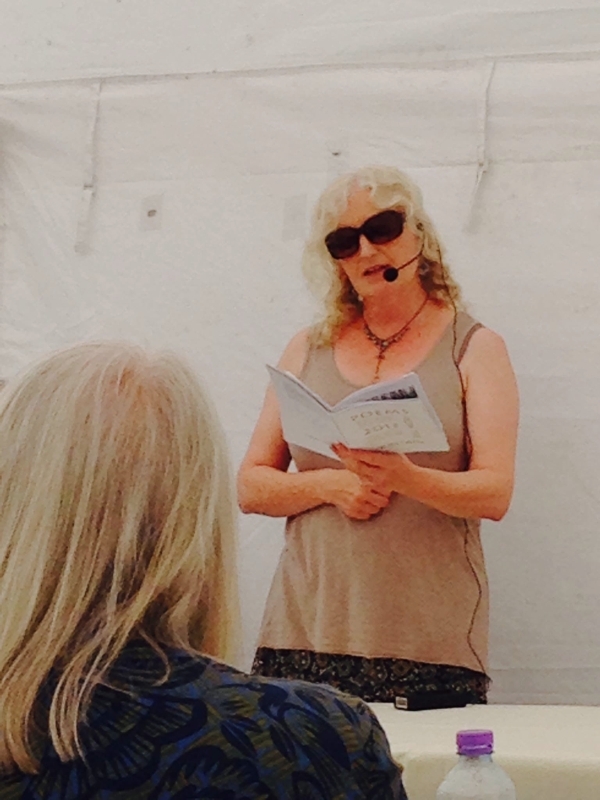 Jo will be reading at Tea and Chi in Glastonbury on 23 September. Wendy will be one of the poets at Twenty Poets Perform in Bristol Central Library on 1 October as part of the Bristol Poetry Festival 2016. This is a really enjoyable event for all concerned, and entrance is free. Full festival details should be on the Poetry Can website pretty soon. Finally, Rachael, Sara, Morag, Jinny, Jo and Ama will be giving a third performance of this year’s collaboration Second Skin at the Tears in the Fence festival fundraiser weekend at Stourpaine in Dorset this coming Saturday, 17th September – details here. Andrew will also be reading at this event. Latest news, hot off the press: Jo, Jinny and Rachael have all had poems accepted for the Broadsheet, which publishes once a year for SW poets. The launch is part of Exeter Poetry Festival in October. The next meeting will be on Monday 3 October in Just Ales Micropub in Market Street (behind the bus station), 7.45 for 8pm. Real ale and local cider on tap, as well as coffee! There will be a Featured Poet and a charge of £2 which will be saved up until we have enough to pay a Guest Poet. 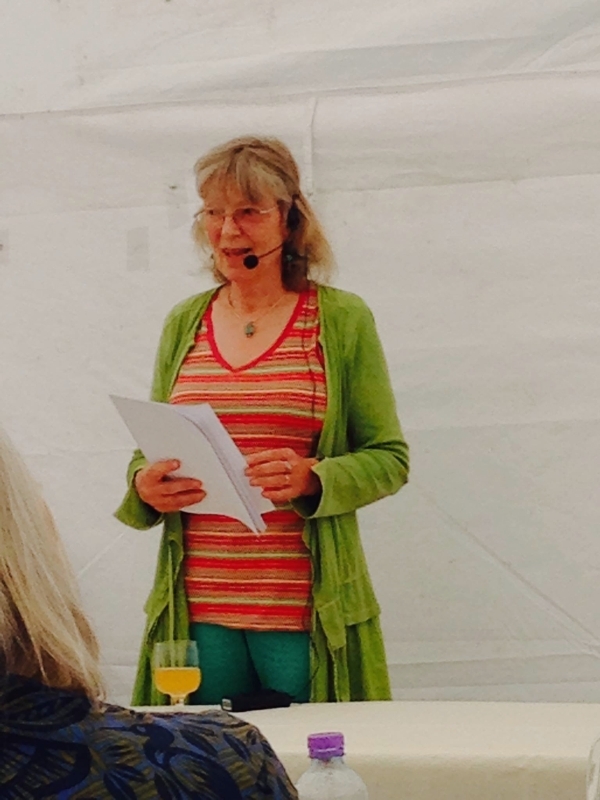 Other news: Poetry readings at Wells Litfest include Lemn Sisssay on 18 October. If you don’t know about him, do listen to his Desert Island Discs on the radio 4 i-player. He’s phenomenal! See the website for details. Toppings bookshop in Bath have a programme of readings, including Carrie Etter and Claire Crowther on 1 October, Katherine Towers on 3 October, Rosie Jackson on 7 November, Alice Oswald in the nearby St Swithin’s Church on 15 November and Ruth Sharman on 16 November. It isn’t necessary to know where a poem is going in order to begin to write. Writing can let you find out what you think. If you know exactly what you are going to say about a subject before you begin your poem, it is probably better to say that thing in prose. This entry was posted in poetry and tagged Alice OswaldCarrie Etter, Ama Bolton, Andrew Henon, Bristol Poetry Festival, Caroline Toll, Claire Crowther, Clare Diprose, Ewa Marcinkowska, Ewan MacPherson, Jinny Fisher, Jo Waterworth, Just Ales, Katherine Towers, Lemn Sissay, Morag Kiziewicz, Paul Rogers, Poetry in Wells, Rachael Clyne, Rosie Jackson, Ruth Sharman, Sara Butler, Tea and Chi, Tears in the Fence, Toppings Book Shop, Wells Festival of Literature, Wendy Nicholson, Yeovil Festival of Literature on September 12, 2016 by barleybooks. 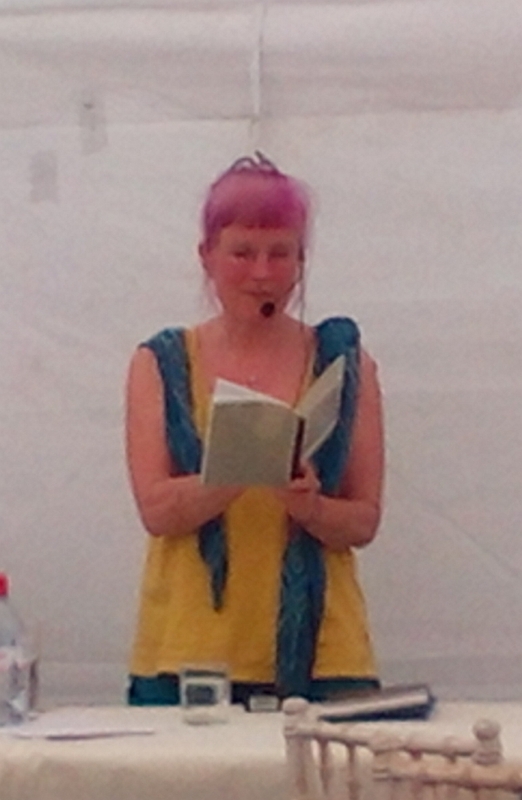 This entry was posted in poetry and tagged Ama Bolton, Andrew Henon, Clare Diprose, David Caddy, Jinny Fisher, Jo Waterworth, Morag Kiziewicz, Rachael Clyne, Tears in the Fence, White Horse Stourpaine on July 9, 2015 by barleybooks. Eighteen poets and two listeners crammed themselves into the small cocktail bar at the Rose and Crown on Monday night to share poems on and off Ewa’s chosen theme “All About Eyes”. Ewa started us off with a poem about being stared at by her mother’s cat. Rachael’s “Still seen” also featured a cat closely observing a human, while Mark’s “If you stare right back” dealt with the experience of being stared at by a child on a bus, and the likely perils of staring back. Wendy read “Night vision” and “Can it be paranoia?”, a poem about being watched. My title is taken from Andy’s “Reflected back”. Chris’s “Eyes are a gift” and “Eyes of Islington” had some strikingly memorable lines too. Karin’s fragments of memoir “Eyes wide shut” and “Shore-lands” were quietly beautiful pieces of writing. Poems dealing with blindness, both literal and metaphorical, included Ama’s “The legend of St Odelia”and “Two eyes”, Mark’s “Love is blind”, Richard’s “Flirting with blindness” and Andy’s “Blind to the suffering”. Mo’s poems were “Open eye” and the powerful “Gaza sonata”. Caroline and Jo contributed haiku. One of Jo’s has just been published in the on-line journal Hedgerow. We heard some erasure poems from Neil and Jinny. Jinny’s other poem “The art of staying dry” suited the weather, and Neil, a master of the sting in the tail, surprised us in the last line of his poem “Better”. 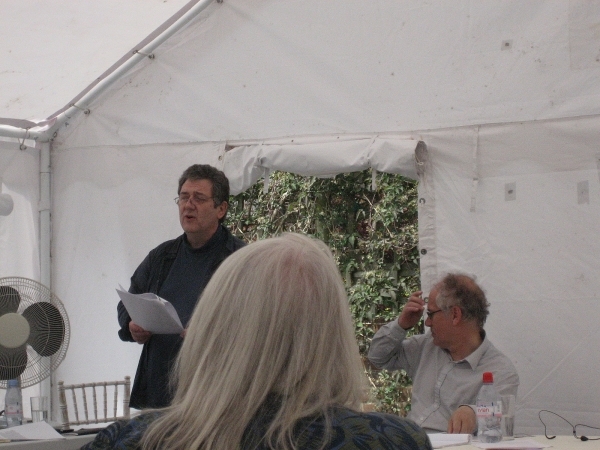 Paul read two topical poems, “Redress, or Death by pole-axe” concerning Richard III and “Beltane in Victoria Park”. Ewan read “A kind of peace” and “The stage”. It was good to welcome Claire Coleman back. She read “Extracting sunbeams” and an untitled poem full of colour and light. Rachael brought an effective surreal prose-poem “Evolution is hard”. 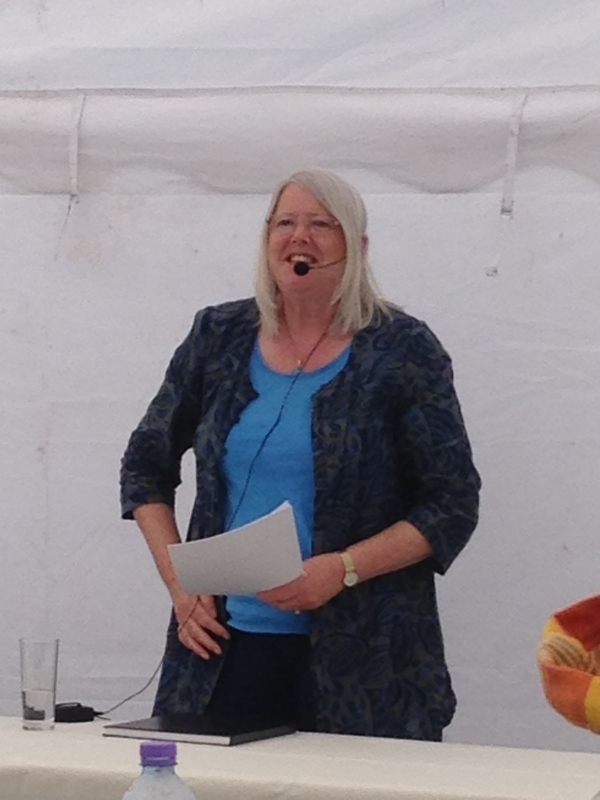 Mo let us know about an offshoot of the Tears in the Fence Festival – a free day of poetry at the White Horse in Stourpaine on Saturday 4th July. 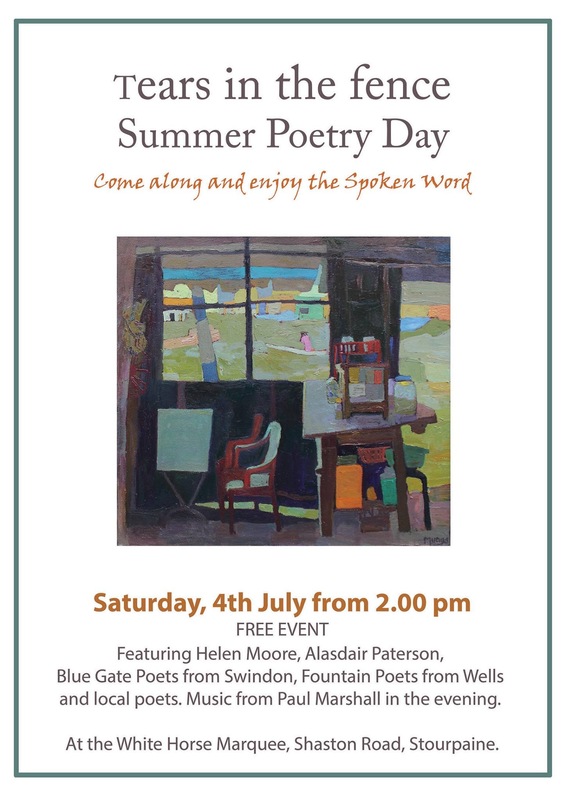 Some of our Fountain Poets will be reading on that day. 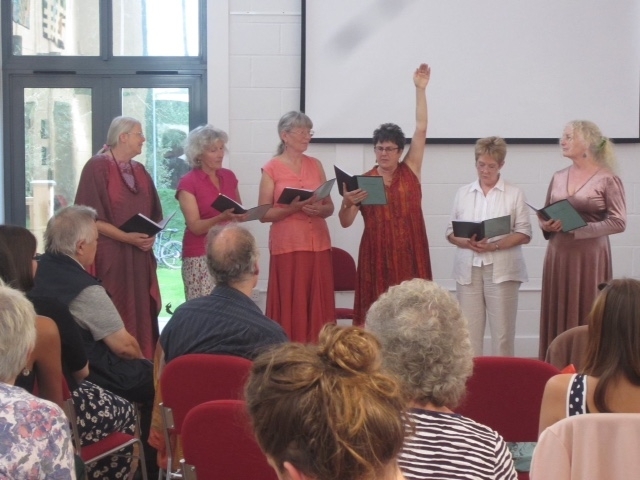 The six of us who performed at the Bath Litfest will be presenting a second performance of “Waterwoven” at Priddy Folk Festival on the evening of Friday 10th July. We do like the cocktail bar, but it is clearly too small for our group. 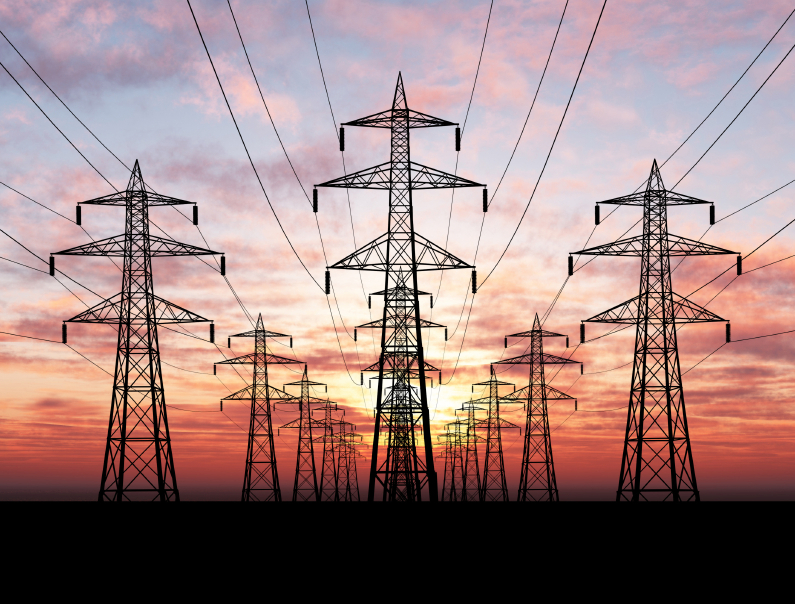 The Sherston Inn has re-opened, so we’ll be meeting there (not in the skittle alley but in the dining room) next month, on Monday 1st June, when Jinny will be in the chair and the topic will be “Power”. This entry was posted in poetry and tagged Ama Bolton, Andrew Henon, Caroline Toll, Chris Scully, Claire Coleman, Ewa Marcinkowska, Ewan MacPherson, Hedgerow poetry, Jinny Fisher, Jo Waterworth, Karin Baynes, Mark Sayers, Morag Kiziewicz, Neil Bowen, Priddy Folk Festival, Rachael Clyne, Richard Field, Sherston Inn Wells, Tears in the Fence, Wendy Nicholson on May 6, 2015 by barleybooks.